This year has brought exceptional upheaval to Daley Road. Thrust into an unfinished building under new management, Bruce Hall has made the transition to SA5, and the college attempts to balance the energy of new residents with the frustration of returners, and establish a new community. The black-glass colossus of SA5 is undeniably luxurious. Rooms have double beds, wall-mounted TVs, and stunning views. Modern bathrooms, the internal courtyard, and functional kitchens distinguish SA5 from other residences; one resident called it “what Lena Karmel should have been”. But despite hiring extra contractors and abandoning the planned roof garden, ANU hasn’t finished the building. Basic utilities are complete, but there are unplastered walls, unfinished cabling and ceilings, broken elevators, and limited access to outdoor areas. Residents have endured fire alarms triggered by low water pressure in sprinklers, and a lack of mobile signal in some areas restricts calls to an SR in emergencies. Common Room Committee (CRC) President Matthew Bowes took an optimistic view of the move-in, explaining “we definitely made the best of it”, but it’s clear O-Week was challenging – one Ursula Residents’ Committee member said she “witnessed first-hand the terror of the CRC” at dealing with the ongoing construction. While reducing costs, the ANU’s decision to give building management to UniLodge troubles many residents. UniLodge-run CCTV monitors Bruce’s new common spaces, and residents will be charged UniLodge rates for cleaning, washing, and lockouts. These tensions flared early last week when UniLodge, without ANU approval, posted an advertisement for “our newest student accommodation property, Bruce Hall”. The ad was deleted after a tweet from VC Brian Schmidt, who affirmed: “ANU remains in charge of Bruce Hall”. Many questions about the Lodge/Bruce interaction remain ambiguous, such as who controls expulsion, a power both parties technically possess. SA5 feels distinctly different to Bruce, and despite the duct-taped Bruce banners in reception, there are clear physical and managerial similarities to the Lodges. While the large first-year cohort is delighted with SA5’s amenities, there is disagreement among returners: according to one CRC member, “Some people are bitter-sweet, others are just bitter”. But the overall mood is reluctant acceptance, and a desire to make a mark. The five-story stairwell is chalked with drawings of dragons and other Bruce memories, and many returners proudly display scavenged memorabilia from the old hall. 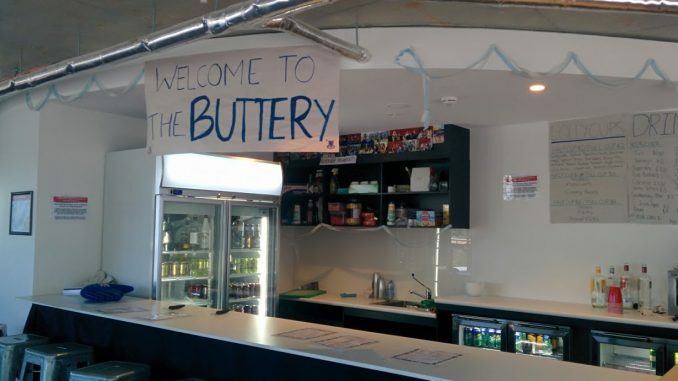 Shocked that SA5 would not include a Buttery (the social centre of old Bruce), students purchased materials and constructed their own bar. While it might not be Bruce, returners are drawing on the nostalgia and loss of their building to reconstruct a sense of community.